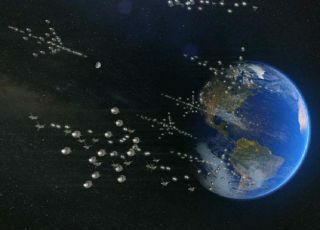 An artist's illustration of a potential alien attack as depicted in the science television series "Into the Universe with Stephen Hawking." Strike one more blow against UFO conspiracy theories. The U.S. government is not in contact with any extraterrestrials from other worlds, nor has any confirmed proof of alien life been found, White House officials say. "The U.S. government has no evidence that any life exists outside our planet, or that an extraterrestrial presence has contacted or engaged any member of the human race," Phil Larson of the White House Office of Science & Technology Policy wrote in a statement published Friday (Nov. 4). "In addition, there is no credible information to suggest that any evidence is being hidden from the public's eye." The message came in response to two petitions posted on the White House's "We the People" site, which allows the public to air grievances through petitions. In this case, one asked the government to "formally acknowledge an extraterrestrial presence engaging the human race," while another requested that the Obama administration "immediately disclose the government's knowledge of and communications with extraterrestrial beings." As of Monday (Nov. 7), the first petition has garnered 12,078 signatures, while the second has 5,387. The White House has promised to respond to any petition that gains a certain number of signatures within a given time — in this case, the requirement was 5,000 signatures. The belief that authorities are hiding evidence of alien life is not a new one. Many UFO proponents insist to this day that extraterrestrial vehicles crashed near Roswell, N.M., in 1947 and were sent for government study at the Area 51 Air Force base in Nevada. Yet the government has consistently denied ever having encountered any UFO hardware or other evidence for extraterrestrials, and scientists say no credible proof of aliens has ever been made public. That doesn't satisfy UFO conspiracy theorists, though. "This Petition calls for the President to disclose to the American people the long withheld knowledge of government interactions with extraterrestrial beings and call for open Congressional hearings to allow the people to become aware of this subject through those whose voices have been silenced by unconstitutional secrecy oaths," reads one of the two recent petitions. "The people have a right to know. The people can handle the truth," said the other. Though the official White House response did quash the idea that the government was hiding information on the subject, Larson openly acknowledged two government-supported efforts to search for signs of E.T. NASA's Kepler space telescope, which was launched in 2009, is on a mission to search for Earth-like planets around other stars in the hopes that some might prove habitable to alien life. And NASA is gearing up to launch its new Mars rover Curiosity this month, which will investigate Martian geology for signs that the Red Planet may once have been hospitable to microorganisms. Larson also cited the Search for Extraterrestrial Intelligence (SETI) project, which began with public funding, that uses radio telescopes to scour the heavens for signals from alien species. "Many scientists and mathematicians have looked with a statistical mindset at the question of whether life likely exists beyond Earth and have come to the conclusion that the odds are pretty high that somewhere among the trillions and trillions of stars in the universe, there is a planet other than ours that is home to life," Larson wrote. "Many have also noted, however, that the odds of us making contact with any of them — especially any intelligent ones — are extremely small, given the distances involved. But that's all statistics and speculation. The fact is we have no credible evidence of extraterrestrial presence here on Earth."